Petey Likes EO for Dogs! Over the years my hubby and I have assumed certain responsibilities for Petey and Marina. Meds and feeding are a joint effort, he gives the liquid medicine, I dispense the pills, I take them to the vet, he gets to give the bath, I dry. We recently had the opportunity to review EO for Dogs Lavender and Aloe Natural Dog Shampoo and Lavender and Aloe Natural Dog Conditioner and the Citrus and Mint Natural Groomer. I’d heard about EO for the first time on the BlogPaws community and was enticed by the fact that they are a family owned and operated, Certified Organic Manufacturer. Petey has a few nicknames, one of them being “Stinky Pete”. He likes to roll around indoors and out and it’s generally not in a bed of roses. He’s a medium-haired mixed breed guy with a tendency towards oily fur. Marina has enough thick fur for at least five other dogs. She is always in “shed” mode. We can vacuum daily and still accumulate those dreaded fur tumbleweeds. Petey was first to get a bath. His last one was about two weeks ago and his fur was already dull and oily. As usual, he was an unwilling participant and has learned to spread-eagle himself as my husband carries his fifty-two pound body down the hall and into the shower. The shampoo lathered very well and smelled great. When it came time to rinse, it easily washed away, taking Petey’s muddy water with it. The conditioner was much thicker than any we have used in the past, it was almost like a cream. It took a little longer and a little larger quantity to work it into his fur, but the end result was a very silky feeling coat that smelled great. With Petey, I’ll be doing a sniff test throughout the week – and hoping he doesn’t find anything too interesting to roll in, in the meantime. I’ll report back on that one. When the”freshness” of the shampoo wears off, we’ll be testing the Natural Groomer product designed to Freshen and detangle. Marina’s experience was the same. Since her coat is much thicker than Petey’s it took a little bit longer to get through the conditioning part of her bath. 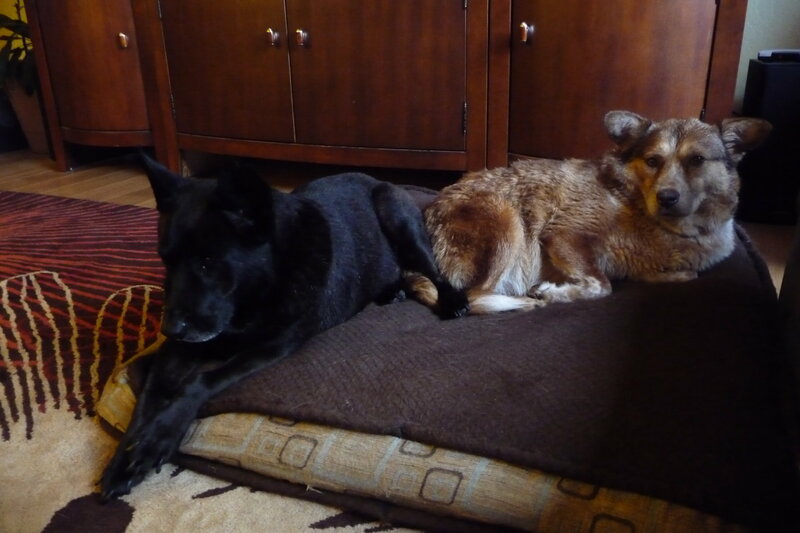 Same end result – a silky clean smelling coat. Thankfully, she has a tendency to stay clean longer and has never had an overpowering dog smell. Thanks to EO Dog Shampoo, we're fresh and clean! Aside from being a natural and organic product, I was impressed with the fact that this is a company that also believes in giving back to the community, something that we value. I will be announcing a give-away this week and EO will be providing the product . Stay tuned! 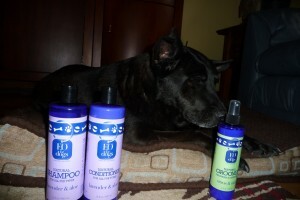 *EO Products has provided the dog shampoo, conditioner and groomer product at no cost for this review. I have received no other compensation for this review. All opinions expressed in this review are my own and are intended to introduce our readers to quality products that have been tested and reviewed.